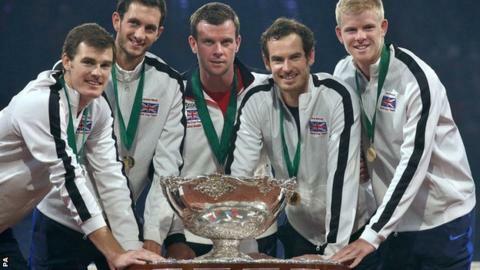 Davis Cup captain Leon Smith says Great Britain can build on their success and inspire a new generation of players. GB won the team of the year award and Andy Murray was voted BBC Sports Personality of the Year on Sunday. Murray has previously said that talking to the Lawn Tennis Association about the future of British tennis was "a waste of time". But Smith said: "We've had really good discussions with everyone at the LTA recently to really take it up a gear." He added: "On the court, we need to keep winning but off the court we have a great chance to do something." LTA plans for 2016 include taking the Davis Cup trophy on tour and issuing 10,000 free junior tennis racquets. Recruitment will start in January for a team of 1,000 coaches to deliver 10,0000 free junior tennis courses where free racquets will be offered. Great Britain Davis Cup captain Leon Smith urges on Andy Murray during the final win. Fifty different venues across Britain will have the chance to host the Davis Cup trophy in their local community, park or club, with some surprise visits from players. "We want to try to inspire as many young people as possible to get into the sport, and more importantly stay in the sport," said Smith. "Part of the legacy is training up as many grassroots coaches as possible to help them. That first interaction with a coach at school or the local club, I think all of us can help that story. "We talk about showcasing our support. I think what we can do for our first round match against Japan in Birmingham in March is pretty amazing - the lead-up to the event, the event itself, and afterwards. It will be packed for that tie, and with Andy confirmed to play, it's going to give us a lot of momentum." Murray, who went 11 games unbeaten in the winning 2015 run, is committed to playing in the first round of the title defence. But Smith knows he may be without him should GB make July's quarter-finals, which are sandwiched between Wimbledon and the 28-year-old Scot's defence of his Olympic title. "It's a huge challenge. The nature of the competition is it is determined by who plays for each nation in any given year," said Smith. "It's very, very busy especially for the likes of Andy who is going to be featuring in the latter stages of the biggest tournaments, it's tough to fit it all in. "We'll see how it goes because once you start in the competition, when these group of players get together, the bond stays pretty close. It's a great feeling. "We've got a strong team, and in the years before had some very big wins, notably against the likes of Russia (in 2013) when Andy wasn't playing." Smith said he was keen to avoid the mistakes of some previous Davis Cup winners that fielded a below-strength side in their first round match the following year, and faced a relegation tie after losing. "The most important thing is we win that first round tie, which brings us into the quarter-finals again and it guarantees World Group status for the following year, which is very important as we try to build on what we have achieved," he added. "Anyone who watched the Davis Cup saw what he went through for the team, to get enough points on the board, particularly the France match over all three days. It's not easy to do at all, and to go the year 11-0 without losing, he was immense.On how he is viewed by the public: "I guess he got off to a bit of a rocky start which wasn't his fault I don't think. We've all known him for a long time, and are very proud of everything he's achieved."